At this 14,300-acre area 50 miles south of Burley, granite columns tower as much as 60 stories high. About half the area of the reserve is privately owned. It is renowned for its scenic, historic and geologic significance. Many of the granite rock formations that are the outstanding features of the Reserve are over 2.5 billion years old, some of the oldest rocks found in North America. The rocks were shaped by weathering forces into the fantastic shapes you see now. 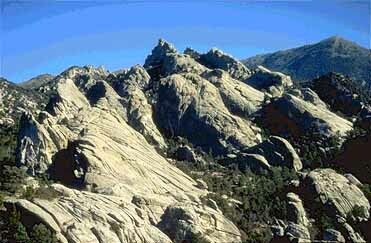 During the westward expansion, the City of Rocks was an important landmark along the California Trail. Many pioneers wrote their names in axle grease on the rocks adjacent to the trail. The Reserve has about 100 primitive campsites. Annual Port-Neuf Muzzleloaders Mountain Man Rendezvous Pocatello ID May31-June2 Enjoy the black powder rifle and pistol shoots, the trailwalks, our knife and hawks throws, the cannons, and the primitive archery shoot. The music at the campfire at the end of the day. Visit the traders of the 1840’s. They are all in canvas of the period as are the Mountain Men and Women of the Primitive Camps. See how they lived and worked daily. Intermountain Equifest Pocatello ID June20-23 We will have trail riding competition, extreme cowboy race, posse drill presentation, grand entry, horse show, barrel racing, pole bending, bucket races, flag races, and kids games. Horseback and on foot. Portneuf Greenway Foundation RiverFest Pocatello ID August17-September17 This is a one day festival which features local and regional bands. This year's headliner band is The Clumsy Lovers. We also have craft booths, commercial booths and lots of great food. There will be a horseshoe tournament as well as our famous raffle. In previous years we have given away camp trailers, boats and cars. Trailing of the Sheep Festival Hailey ID October10-13 Our mission is to gather, present and preserve the history and culture of the families and individual men and women involved in Idaho sheep ranching and to honor their contributions to the development of Idaho and the West.